Earlier in 2016 Aberdeen Art Gallery & Museums was very fortunate to be offered a gift of costume designed by Bill Gibb. 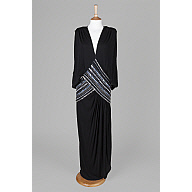 Bill Gibb was one of the fashion industry's most talented and innovative designers. Born in the small rural village of New Pitsligo, and educated at Fraserburgh Academy, he studied fashion at St Martin's School of Art, London, and at the Royal College of Art. 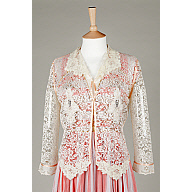 His career quickly blossomed following his nomination as Vogue magazine's Designer of the Year in 1970. 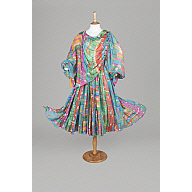 Gibb was noted for the clothes he designed, in unusual combinations of fabric and pattern, to fit and flatter the female wearer, and for his collaboration with Kaffe Fassett on knitwear. He fell victim to the late 1970s recession, but continued to work for private clients and on small-scale projects until his death in 1988. 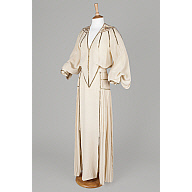 Aberdeen Art Gallery & Museums holds the largest archive of Bill Gibb's work including over 2,500 of his design drawings and over 120 garments. 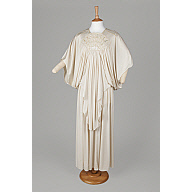 While all the garments in this recent donation are exceptional, of particular interest is the cream Qiana jersey ensemble from Bill Gibb's Spring/Summer 1973 Collection (ABDMS093638 & 093639). Garments designed by Bill Gibb for that collection were modelled by the actress Charlotte Rampling for an article in the February 1973 edition of Harpers & Queen magazine. 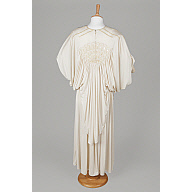 The shell-like fan-shaped beaded panel from the Qiana jersey top now in the AAGM collection also decorated a cream Qiana jersey dress worn by Charlotte Rampling for that article. 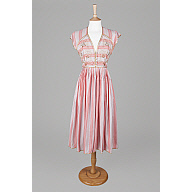 The brightly coloured hand-printed silk chiffon dress (ABDMS093643) is also an important acquisition. 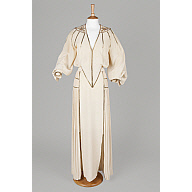 This dress was designed by Bill Gibb for the Spring/Summer 1977 Collection. This particular collection was unveiled at the 10th anniversary event held to celebrate Bill Gibb's career at the Royal Albert Hall in 1977. The show was a retrospective and many people loaned back their outfits and even modelled them on stage. Amongst the models were some famous faces including Eileen Atkins, Leslie Anne Down, Zoe Wanamaker and Hannah Gordon. Found 8 Results. Showing records 1 to 8. Page 1 of 1.